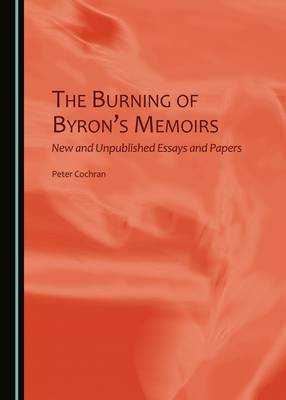 The Burning of Byron's Memoirs is a collection of new and uncollected essays, and papers given at many conferences over a two-decade period. They cover many aspects of Byron's life and work, including his relationship with his parents, his library, his attitude to Shakespeare, his borrowings from other writers, and his feelings about women and men. Two essays centre on his close friends Hobhouse and Kinnaird. All are informed by first-hand acquaintance with primary texts. The title essay has been hailed as the best-ever documentation of the disgraceful way in which Byron's Memoirs were destroyed within days of his death being announced.For anyone interested in Byron either as a man, a poet, or as a cultural phenomenon, The Burning of Byron's Memoirs is essential reading.